The Rock Falls Community Building will be the site for the annual Rock Falls Rotary Corn Boil on Monday, July 23, from 11 a.m. – 7 p.m. Keith Zoeller is Chair of this event. Cost of the tickets is $8/adults and $4/children under 12. Menu includes Pulled Pork Bar-B-Q or hot dog, chips, beverage and all the corn you can eat. Drive through service is also available. Tickets may be purchased in advance from any Rock Falls Rotary Club member or at the door on the day of the event. Orders of 10 or more meals may be pre-ordered for pick-up at a requested time if faxed to Keith at 815 / 625- 3726 or emailed to zoeller@essex1.com no later than Sunday, July 22, by noon. No pre-orders for pick-up will be taken the day of the event. To place a pre-order, give name, phone number and number of meals of each sandwich choice along with the desired hour (11 a.m. – 6 p.m.) for time of pick-up. This year 2018 will mark the 79th year that this has been an annual event for the Rock Falls Rotary Club. The original Rock Falls Rotary Club Corn Boil was an activity for the club members and their families which expanded over the years into what has become the major fundraising event for the club. 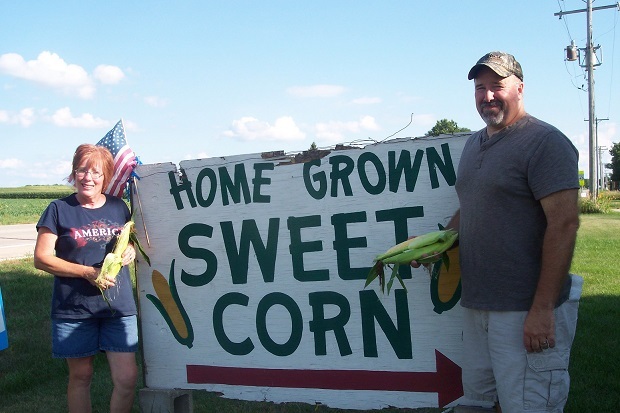 Wilson and Lorraine King were the original hosts to this event on their farm south of Rock Falls. This event has grown into a community event with over 1500 meals being served. Proceeds from this annual event will benefit the many community projects and youth support of the Rock Falls Rotary. The public is invited. Keith Zoeller (right), Chair of the Rock Falls Rotary Corn Boil, is making final preparation with Cindy Poci, co-owner with Jerry Poci of Poci’s Market, for the sweet corn that will be used for the 79th Annual Rock Falls Rotary Corn Boil to be held July 23at the Rock Falls Community Building from 11 a.m. – 7 p.m.